Regarding the Libya attack, Romney said, "It's never too early for the United States government to condemn attacks on Americans and to defend our values." In our Oprah-rized, touchy-feely metro-sexual society, the mainstream media and Democrats are trying to portray Romney as an out-of-control reckless cowboy. This mindset that the slightest forcefulness and decisiveness is deemed to be extreme reflects the mainstream media's and the Democrat's decades long War on Testosterone. The left takes everything to its extreme. For example: If you believe the definition of marriage should remain between one man and one woman, the MSM and Democrats accuse you of hating gays and seeking violence against them. Little boys acting like boys is cause for the left to recommend that they be drugged. Obama's response to the murder of a U.S. ambassador and three staffers is metro-sexual at best. During Obama's press conference in response to the attack, a reporter asked if the Obama administration considered the attack in Libya an act of war. Obama would not respond to the question. Is real manhood a no-no in America today? In typical fashion, I am sure the left will attempt to distort my celebration of manhood. They will accuse me of attacking womanhood and requesting that Obama act like an idiotic macho Neanderthal. I am not. Rather than the mainstream media addressing Obama's wimpy response to "our houses" abroad being violated and Americans being murdered, the media is ganging up on Romney for his swift and strong response. 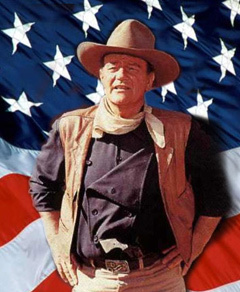 I watched a John Wayne movie the other day in which his character thought his son was dead. When his adult son reappeared, the Duke punched him. "That's for scaring me half to death!" Yes, the movie character's response was over the top. And, I am not condoning a father punching his son. But folks, I have to tell you that it was extremely refreshing to witness male toughness in the father and his son. The father and son were not crying on the Oprah show or discussing their dysfunction with Dr Phil. Manhood is being wimped down folks, from pro football to committed heterosexuality being branded closed-minded. Elementary school kids are taught to be open-minded enough to give homosexuality a try before deciding their sexual preference. Unlike their liberal counterparts, conservative women do not despise testosterone. Sarah Palin and Michele Bachmann would display stronger leadership in response to these attacks on America than our liberal apologetic metro-sexual president. As our enemies feel more and more embolden by tepid responses, America needs a real Commander-in-Chief.